It is with great sadness that we heard the awful and tragic news of several attacks on worshippers in Churches across Sri Lanka recently. Our thoughts and prayers are with the victims and their families. May God bring peace and stability to Sri Lanka and to the world. Amen. The Letterkenny Islamic Association completely condemns the actions of the perpetrators and the evil ideology they followed. This ideology is far away from the true message of peace that Islam teaches. We pray that those who are misguided and follow this evil ideology are rightly guided towards the right path. And that those responsible either directly or indirectly are held accountable. 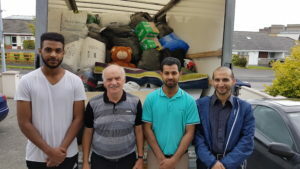 The Letterkenny Islamic Association and the Donegal Intercultural Platform are carrying out another clothing appeal for Syrian refugees in refugee camps. Please note that the last date for drop off is the 19th of January. The refugees in these camps are often very cold and need clothes, blankets etc to survive. Items for babies are also URGENTLY required. The last two clothing appeals we did in 2017 and 2018 were very successful with the last one requiring not one but two visits by the collection van. Let’s make this one even better! Daily 1:40 (except Fridays) or 7:10 and Saturdays 1:30 to 2:30. 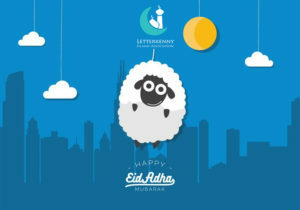 The Letterkenny Islamic Association wishes to congratulate all Muslims in Letterkenny, Co. Donegal and all around the world on the occasion of Eid ul-Adha which is confirmed for Tuesday the 21st of August insha Allah. May Allah accept from us and from you. Eid prayers will start at 8:15 sharp in the Letterkenny Community centre insha Allah. We will start doing takbeer from 8 insha Allah so please do come along early and join us in the takbeer. The words of the takbeer are as follows. God is The Greatest, God is The Greatest. There is no deity except for God. God is The Greatest, God is The Greatest. All praise is to God. As with other Eid prayers, the whole family is encouraged to come so sisters and children can enjoy the occasion as well. We ask everyone to please bring prayer mats with them from home as the numbers have gotten very high in recent times. The Letterkenny Islamic Association wishes to congratulate all Muslims in Letterkenny, Co. Donegal and all around the world on the occasion of Eid ul-Fitr which is confirmed for Friday the 15th of June insha Allah. May God accept from us and from you. Eid prayers will start at 8:15 sharp in the Letterkenny Community centre insha Allah. Please come early to join in the takbeer before prayers insha Allah. Please try and bring your own prayer mat if possible. Last year, we raised €1,300 for the local We Care Letterkenny Food Bank thanks be to God. This year, we’re looking to raise even more! We’re currently in the month of Ramadan where Muslims who are physically able are required to fast from daybreak to sunset every day for a month. This means no food or water during these hours. But it’s not as hard as you think! We’re encouraging our non-Muslim friends and neighbours to get involved again this year and take the second Annual Charity Fasting Challenge! If you think you won’t be able to do it, think again! People who took part last year told us it wasn’t as hard as they thought it would be. Of course it was a challenge but they did just fine. So, the Letterkenny Islamic Association would like to extend an invitation to all non-Muslims to take part in the second Annual Charity Fasting Challenge. What’s this sponsored fast about? We’re inviting people to try fasting the way Muslims do for one day during Ramadan on Saturday the 2nd of June. All money raised will be given to the We Care LK Food Bank. People below the poverty line often rely on food banks to be able to feed themselves and their children. Please help them out! We’d love you to come and break your fast as our guest and sample some delicious ethnic food. We regret that places are limited so if you’d like to join us, please fill out the Google form at the link below and come along to the Letterkenny Community Centre on Saturday the 2nd of June at 9:30 pm. Just bring yourselves and an empty stomach. We’ll take care of the rest! We regret that places are limited so if you’d like to come along, don’t delay! What’s this Ramadan all about? Ramadan is one of the holy months in the Islamic calendar. Kinda like lent but for Muslims. Muslims fast from dawn to dusk every day for a month. Whilst fasting, Muslims abstain from eating, drinking (even water), sexual relations and generally try extra hard to be a better person. That means trying extra hard not to lose their temper, gossip, backbite or anything else. It’s a form of worship where the idea is to get better at self-restraint (it’s like a workout for the soul) and to feel empathy for and really understand what it’s like for people around the world who may have a lack of food or clean water. Muslims believe that fasting is a commandment from God. The same God that Christians and Jews believe in. Muslims view Islam as a continuation of the message of previous messengers of God who are shared in Islam (e.g. Jesus, Moses, Abraham etc). For how long do they fast for exactly? Ramadan starts approximately 10 days earlier each year. This year, it started in the middle of May and will go on till the middle of June. That means the longest day of fasting this year will be from just before 3 am to just after 10 pm. What?!! 19 hours without even water?! Yep. Though it’s easier than you might think. People prepare by making sure to drink plenty of water the night before and eat foods that give a slow release of energy and water (like beans and cucumber). If someone is feeling dangerously faint then they really must and are expected to break their fast. You’re not supposed to hurt yourself! If you are planning on fasting, please be sure to eat a good meal full of protein and carbohydrates late the night before. Generally, anybody from the age of puberty onwards fasts. Those who don’t have to fast include children, people travelling and women who are pregnant or breastfeeding. IMPORTANT: Who DEFINITELY shouldn’t fast? There are certain categories of people who should not fast for medical or other reasons. These include people who have an illness or a condition that would prevent them from fasting or where fasting would be dangerous for them. If someone is not feeling well for any reason or is experiencing something that may make it particularly difficult to go without food or water, they shouldn’t fast. If you are feeling unwell or dangerously faint – please break your fast! We don’t want anybody getting hurt! Muslims who are fasting and feel faint are expected to break their fast and the same goes for anyone taking on this challenge. Good luck and thanks for taking part! The Letterkenny Islamic Association would like to wish all Muslim brothers and sisters in Letterkenny, Co. Donegal and all around the world a blessed month of Ramadan which will insha Allah start on Thursday the 17th of May. May Allah accept the best deeds from us and from you. Ameen. 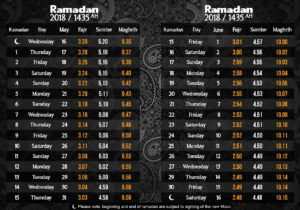 As SCR Mosque in Dublin, Saudi Arabia, Belfast and most of the UK as well as most other Muslim countries have announced that Ramadan will start on Thursday insha Allah, we have decided to go with this decision as well. We pray to Allah for unity amongst all Muslims in the future. Please find below images of the timetable cards distributed during Friday prayers last week. Taraweeh prayers will start Wednesday evening at 10:45 PM in the community building at the Letterkenny Community Centre insha Allah. 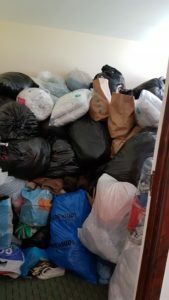 Thanks be to God, the last clothing appeal we did in 2017 was a great success and a large amount of clothing and other items were gathered for the refugees who are in dire need of any and all help we can give them. Please note that there is an URGENT need for nappies in the camp sites. The appeal is running until the 16th of March. For more information on drop off points etc, please visit this page. 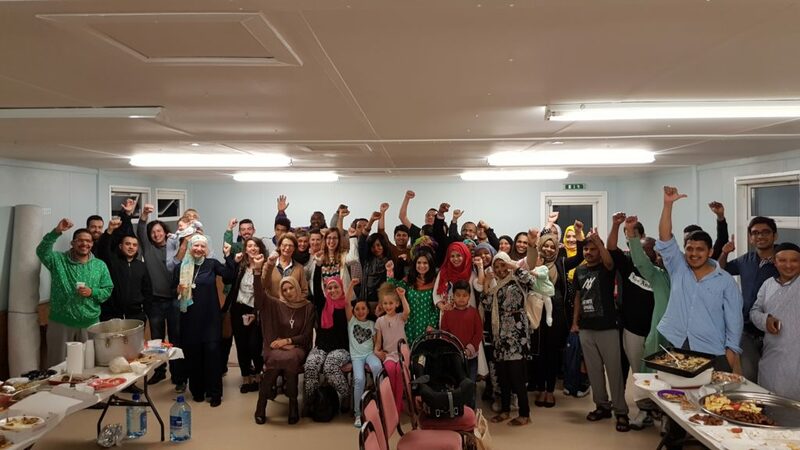 The Letterkenny Islamic Association is moving forward with the Islamic Club that was started by some brothers and sisters in the community. May Allah reward them for their efforts. They are now involved in – and working with – the Letterkenny Islamic Association Committee. We are now looking to expand the activities in the near future insha Allah. We have published the two Google forms below to be filled out by people who are interested. One link is for people interested in enrolling children as students. The other is for people expressing an interest in volunteering as teachers or just assisting in classes. The success of the school will rely on the availability of volunteers at this stage so please do come forward if you can spare an hour or two. Please note: The student form is merely to gauge interest and get an idea of the numbers to help with organisation. If interest is sufficiently high, we shall start a formal registration process in the future. For now, please just fill this form in if you are interested in enrolling your children in such a program. We hope to see a positive response. If there are any queries, please don’t hesitate to get in touch. Clothing Appeal a Great Success! Alhamdulilah, all praise be to God, the clothing appeal for the Syrian refugees abroad was a great success! 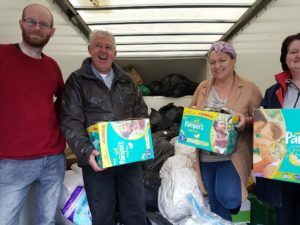 There were a number of drop off points around the county and the response from the whole community across Donegal from both non-Muslims and Muslims alike has been truly breathtaking! 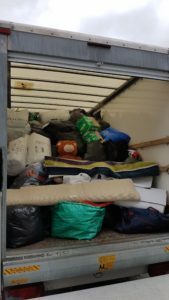 As you can see from the pictures below, there was a great amount donated that needed not just one but TWO separate collections from both the Letterkenny Islamic Community Centre and Siopa Pobail in Falcarragh. The room in Letterkenny was FULL! The items donated were collected by Aidan Crawford of the St. Vincent de Paul Society in the north of Ireland. Aidan has been working closely with the charity Syria Appeal in England and, since his presidency of the St. Vincent de Paul society has come to an end, he has set up a new charity called HeartShip which will continue to help Syrians abroad. God bless Aidan and all those in his organisation who do this great work and keep them safe from harm in this dangerous area of the world. Amen. We plan to do regular clothing appeals since this was such a success to keep your eyes pealed if you’d like to donate in the future! 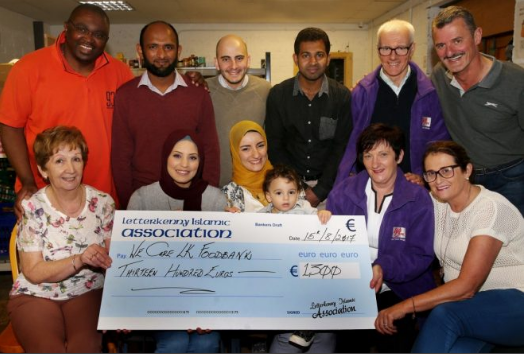 Alhamdulilah, all praise be to God, a total of €1,300 was raised for the We Care LK Food Bank!! 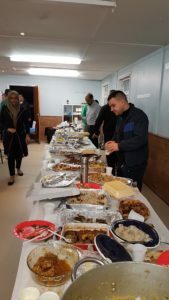 The money was raised through a combination of money raised through the Charity Fasting Challenge on Friday the 23rd of June along with money donated by the local Muslim community throughout the month of Ramadan. 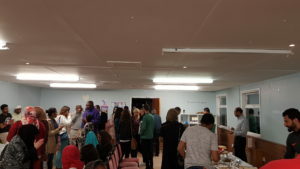 During the Charity Fasting Challenge, non-Muslims were invited to fast for one day with Muslims and were invited to break their fast along with the Muslim community at sunset in the Letterkenny Community Centre. There was food from all over the world and it was a great occasion. Part of the spread. Delicious! The money was raised during the month of Ramadan which is one of the most sacred months of the year for Muslims. During this month, Muslims observe fasting from dawn to dusk for a month. Whilst fasting, Muslims refrain from eating or drinking (even water), smoking, sexual relations and generally try harder to be a better human being by trying to be more patient and making extra effort to control their temper amongst other things. A general training of the soul. This is considered to be part of the tradition of fasting as carried out by Christians and Jews which are considered part of the Abrahamic faiths along with Islam. Whilst fasting, Muslims feel what it’s like to be truly hungry and appreciate the plight of those who can’t feed themselves or have access to clean water. This appreciation is supposed to lead to greater donations in charity to those in need. The local We Care LK Food Bank do great work in supporting those in Letterkenny and across Donegal who need this kind of support regardless of their race, creed or colour. God bless them for all their hard work. Amen. The donation presentation was covered in the Donegal News here. The Letterkenny Islamic Association are planning to hold this event every year so keep an eye out towards the start of next Ramadan!